Prior to the development of exchange lists in 1950, meal planning for persons in the United States with diabetes was chaotic, with no agreement among the major organizations involved with diabetes and nutrition . To solve this problem, the concept of "exchange," or "substitution," of similar foods was developed by the American Dietetic Association, the American Diabetes Association, and the U.S. Public Health Service. The goal was to develop an educational tool for persons with diabetes that would provide uniformity in meal planning and allow for the inclusion of a wider variety of foods. The word exchange refers to the fact that each item on a particular list in the portion listed may be interchanged with any other food item on the same list. An exchange can be explained as a substitution, choice, or serving. Each list is a group of measured or weighed foods of approximately the same nutritional value. 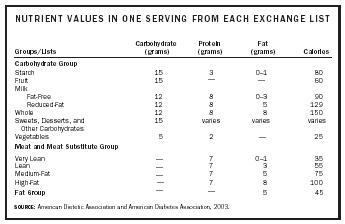 Within each food list, one exchange is approximately equal to another in calories , carbohydrate , protein , and fat . To use the exchange lists, an individual needs an individualized meal plan that outlines the number of exchanges from each list for each meal and for snacks. The American Diabetes Association recommends that because of the complexity of nutrition issues, a registered dietitian, knowledgeable and skilled in implementing nutrition therapy into diabetes management and education, be the team member developing and implementing meal plans. The meal plan is developed in cooperation with the person with diabetes and is based on an assessment of eating changes that would assist the individual in achieving his or her target metabolic goals and of changes the individual is willing and able to make. Because of the accuracy and convenience of the exchange system, the exchange lists are used for weight management as well for diabetes management. Cereals, grains, pasta, breads, crackers, snacks, starchy vegetables, and cooked beans, peas, and lentils are on the starch list. In general, one starch exchange is ½ cup cereal, grain, or starchy vegetable; one ounce of a bread product, such as one slice of bread; one-third cup rice or pasta; or three-fourths to one ounce of most snack foods. Fresh, frozen, canned, and dried fruits and fruit juices are on the fruit list. In general, one fruit exchange is: one small to medium fresh fruit, one-half cup of canned or fresh fruit or fruit juice, or one-fourth cup of dried fruit. Different types of milk and milk products, such as yogurt, are on the milk list. One cup (eight fluid ounces) or two-thirds cup (six ounces) of fat-free or low-fat flavored yogurt sweetened with a non-nutritive sweetener are examples of one exchange. Vegetables are included in the Carbohydrate Group and are important components of a healthful diet. However, since three servings of vegetables are the equivalent of one carbohydrate serving, one or two servings per meal need not be counted. This was done to encourage consumption of vegetables and to simplify meal planning. Meat and meat substitutes that contain both protein and fat are on the meat list. In general, one exchange is: one ounce meat, fish, poultry, or cheese; or one-half cup beans, peas, lentils. In general, one fat exchange is: one teaspoon of regular margarine, mayonnaise, or vegetable oil; one tablespoon of regular salad dressings or reduced-fat mayonnaise; or two tablespoons of reduced-fat salad dressings. •A free food is any food or drink that contains less than 20 calories or less than five grams of carbohydrate per serving. Foods with approximately 20 calories should be limited to three servings per day and spread throughout the day. Some foods are in one list, but they may fit just as appropriately in another list. For example, foods in the Starch, Fruit, and Milk lists of the Carbohydrate Group each contribute similar amounts of carbohydrates and calories and may be interchanged. If fruits or starches are regularly substituted for milk, calcium intake may be decreased. Conversely, regularly choosing milk instead of fruits or starches may result in inadequate fiber intake. Foods from the Other Carbohydrate list of the Carbohydrate Group, the Combination Foods list, and the fast foods list are also interchangeable with the Starch, Fruit, and Milk lists. However, most of the dessert-type foods on the Other Carbohydrate list are higher in sugars and fat and need to be eaten within the context of a healthful meal plan. Beans, peas, and lentils are included in the Starch list of the Carbohydrate Group. The serving size (usually one-half cup) is counted as one starch and one very lean meat for vegetarian meal planning. If individuals are not practicing vegetarians, or use these foods less frequently and often as side dishes rather than main dishes, the very lean meat exchange does not need to be counted—one-half cup is equivalent to one starch. Skim and reduced-fat milks are recommended for adults and children over two years of age, rather than whole milk. Meat choices from the Very Lean or Lean Meat lists are encouraged. However, it is not necessary to add or subtract fat exchanges when using meat lists that differ from those ordinarily consumed. Whenever possible, monounsaturated or polyunsaturated fats should be substituted for saturated fats. Despite the many advantages the exchange lists offer, they may not be the most appropriate meal-planning tool for many persons. For instance, they are not appropriate for those who cannot understand the concept of "exchanging" foods. Because the exchange booklets are written at a ninth- to tenth-grade reading level, individuals must be able to either read at this level or understand the concept of exchanging foods. For an individual to use them effectively, several educational sessions, and practice, may be required. In 1950, the following problems that had led to inconsistencies in food recommendations for persons with diabetes were identified: (1) methods used to estimate the composition of a diet were prolonged and needlessly precise; (2) there were many inconsistencies in the inclusion or restriction of foods; and (3) sizes of recommended portions were often stated in impractical amounts that were difficult to measure. Recognizing these facts, the food values given in table 1 were established. By combining foods of similar composition into food exchange lists, long and extensive lists of foods could be greatly abbreviated. The first major revision of the exchange lists was published in 1976. The goals at that time were: to be more accurate in the caloric content of listed foods, to emphasize fat modification, and to provide for individualized meal plans to be used with the exchange lists. The next revision of the exchange lists occurred in 1986. The goals of this revision were to ensure the exchange lists would reflect the principles of nutrition and to develop a database of the nutrient composition of the foods listed. Using the data from the database, revisions in the nutrient values assigned to some exchanges were made. For example, the Fruit list was changed from 10 grams of carbohydrate to 15 grams, with a subsequent increase in calories from 40 to 60 per exchange serving, to reflect the content of typical fruit portions. SOURCE: Caso, E. K., Journal of the American Dietetic Association. SOURCE: American Dietetic Association and American Diabetes Association, 2003.
first and included the Other Carbohydrates list, which lists foods containing carbohydrate and fat, such as sweets, pie, cake, and ice cream. Foods on the Other Carbohydrate list usually provide 1 to 2 carbohydrate choices and 1 to 2 fat exchanges, and they may be interchanged with items on the Starch, Fruit, or Milk lists and the Fat list, if appropriate. The American Diabetes Association and the American Dietetic Association published the latest version of the Exchange Lists for Meal Planning in January 2003. Food lists were updated and the Other Carbohydrate list was renamed the Sweets, Desserts, and Other Carbohydrates list. Each list begins with generalized servings of exchange. The nutrient values from the 1995 and 2003 exchange lists are the same and are listed in table 2. Also included in the booklet are a listing of free foods (foods containing less than 20 calories and 5 grams of carbohydrate); combination foods (entrees, frozen entrees, soups), and fast foods. American Diabetes Association, and American Dietetic Association (2003). Exchange Lists for Meal Planning. Chicago and Alexandria, VA: American Dietetic Association and American Diabetes Association. American Dietetic Association (2003). "Evidence-Based Nutrition Principles and Recommendations for the Treatment and Prevention of Diabetes and Related Complications." Diabetes Care 26(suppl. 1):S51–S61. Caso, E. K. (1950). "Calculation of Diabetic Diets. Report of the Committee on Diabetic Diet Calculations, American Dietetic Association. Prepared Cooperatively with the Committee on Education, American Diabetes Association and Diabetes Branch, U.S. Public Health Service." Journal of the American Dietetic Association 26:575–582. Franz, M. J.; Barr, P.; Holler, H.; Powers, M. A.; Wheeler, M. L.; Wylie-Rosett, J. (1987). "Exchange Lists, Revised 1985." Journal of the American Dietetic Association 87:28–34. Wheeler, M. L.; Franz, M.; Barrier, P.; Holler, H.; Cronmiller, N.; Delahanty, L. (1996). "Macronutrient and Kilocalorie Database for the 1995 Exchange Lists for Meal Planning: A Rationale for Clinical Practice Decisions." Journal of the American Dietetic Association 96:1167–1171.